Flemish painter. He attended evening classes at the Bruges Academie in 1794-95 and then went to Paris, where he entered the studio of the Bruges artist Joseph-Benoît Suve. In 1801 he began training under Jacques-Louis David and in 1804 won the Prix de Rome for his Death of Phocion (Paris, cole Nationale Suprieure des Beaux-Arts), in which he faithfully adhered to the principles of David s teaching. Before going to Italy he spent a year in Bruges carrying out portrait commissions, including the Marquis de Chauvelin (1805; Bruges, Groeningemuseum). During his time in Rome (1805-12) he copied antique and Renaissance works, taking a particular interest in Raphael, who features in his wash drawing the Master of Urbino Introduced by Bramante to Julius II (1807; Bruges, Groeningemuseum), a study for a lost painting. Around 1811 he was among the artists chosen to decorate the Palazzo del Quirinale for Napoleon s visit, although he never executed more than a sketch, Tanaquil Predicting the Future Greatness of Servius Tullius (c. 1811-12; Dijon, Muse Magnin). 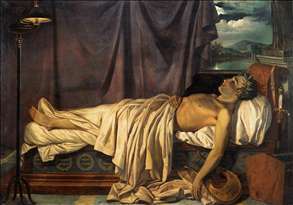 Odevaere successfully exhibited in Paris in 1812 and then moved to Ghent, showing works at the Salon there two years later. After the union of the Low Countries in 1815 he became official painter to William I. As a result of this post he executed several works illustrating the history of the Dutch royal family, including the Prince of Orange Wounded at Waterloo (1817) and the Battle of Nieuwpoort (1820; both Brussels, Palais de Justice). In 1815 he was commissioned to recover works of art taken from the Low Countries by the French. David s arrival in Brussels in 1816 coincided with the beginning of Odevaere s most ambitious composition, the Departure of the Athenians for Salamis (1816-25; Brussels, Muse d Art Ancien), inspired as much by Jean-Auguste-Dominique Ingres as by David, although the latter frequently advised Odevaere on the painting. From 1825 to 1829 he worked on a series of paintings conveying his support of the philhellenic committees created during the Greek War of Independence. The Last Defenders of Missilonghi (1826; Amsterdam, Rijksmuseum) and the Victory of Constantin Canaris (Brussels, Musee d Art Ancien) were shown at exhibitions charging an entrance fee in aid of refugees. Throughout his life, however, Odevaere was noted for his opportunism and conceit, traits that emerged in the many articles he sent to local newspapers, particularly L Oracle. He was also the author of several treatises on art. 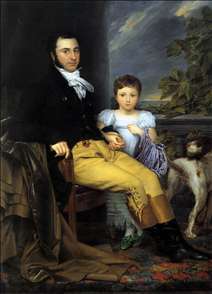 See more details about "Portrait of François Wynckelman, François van der Donckt and Joseph Odevaere"
See more details about "Portrait of a Prominent Gentleman with his Daughter and Hunting Dog"
See more details about "Lord Byron on his Death-bed"